Before Thursday’s film (8/23): a performance by Jean Lukitsh and Mike Nuell (Chinese Wushu Research Institute). Before Friday’s film (8/24), a dance performance by the ACDC’s Asian Voices of Organized Youth for Community Empowerment. Before Saturday’s film (8/25): a lion dance and a Kung Fu demonstration by the Wah Lum Kung Fu Athletic Association. Before Sunday’s film (8/26): a Tai Chi demonstration led by members of Bow Sim Mark Tai Chi Arts Association. Every Night: WALKING TOURS , THU-SUN 8/23-26/12. Explore Chinatown on a special walking tour led by youth from the Asian Community Development Corporation. Get an in-depth look at Chinatown and its transformations over time, and connect with dynamic community workers who are working to preserve and revitalize this unique community. Learn about Chinatown’s unique urban environment, visiting historic sites that serve as connection points across generations and languages. Reduced fee of $5 per person during Films at the Gate, all proceeds support Asian Voices of Organized Youth for Community Empowerment (A-VOYCE). Meet 6PM at the Chinatown Gate (Google Map). For more information contact avoyce@asiancdc.org. Download flyer and sign-up form from ACDC. Over the top doesn’t begin to describe this movie. A true cult classic, cited by Quentin Tarantino as “one of my favorite movies of all time,” it has served as inspiration for artists as diverse as the Wu Tang Clan and the makers of the Street Fighter video games. 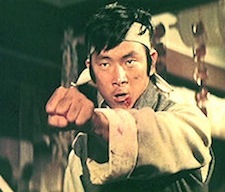 A blind assassin, an expert in the dreaded Flying Guillotine, tracks the famous one-armed boxer through the martial world. (93 min. In Mandarin. Written and directed by Jimmy Wang Yu. Starring Jimmy Wang Yu, Kam Kong, Doris Lung. Fight choreography by Lau Kar-leung and Lau Kar-wing.) Learn more about this film from curator Jean Lukitsh. 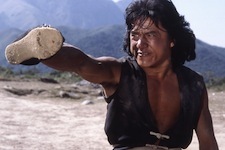 THE YOUNG MASTER [師弟出馬] (1980). Jet Li’s first movie, and the film that introduced modern competition wushu to the world. SHAOLIN TEMPLE was shot on the actual grounds of the revered temple, and features top Chinese champions and coaches of the era. 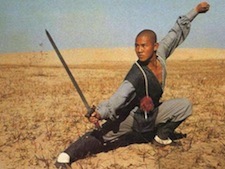 Yu Cheng-hui, the villain of SHAOLIN TEMPLE, is the star of THE SWORD IDENTITY (2011), a recent arthouse hit. (99 min. In Mandarin. Directed by Chang Hsin-yen. Starring Jet LI, Yu Hai, Yu Chenghui, Ji Chunhua, Hu Jianqiang. Fight choreography by Yu Hai, Pan Qingfu, Ma Xianda, Wang Changkai.) Learn more about this film from curator Jean Lukitsh. IP MAN 2 [葉問2:宗師傳奇] (2010).